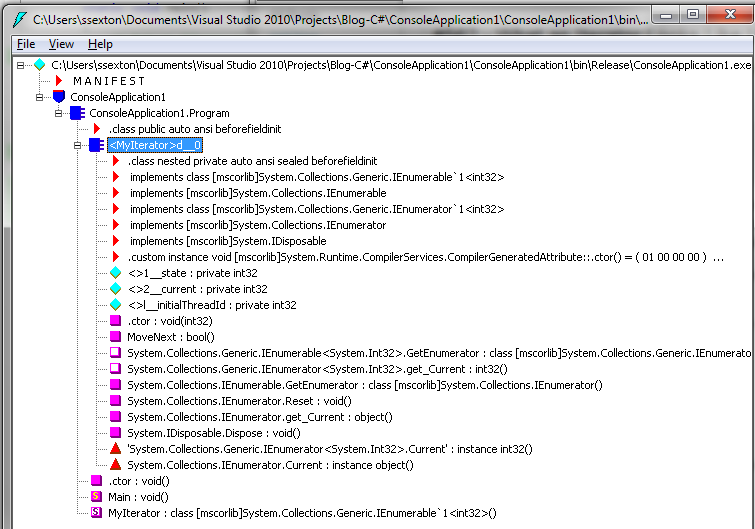 When you use an iterator to return an enumerable sequence of items, the C# compiler converts your iterator block (containing one or more yield return statements) into a new class that performs the actual enumeration. The new class actually implements all four interfaces that an iterator can return–IEnumerable, IEnumerable<T>, IEnumerator and IEnumerator<T>. Below is a simple iterator block that returns a sequence of two elements. If you use a disassembler to look at the IL that the compiler generates for this code, you’ll see a new class that implements the four interfaces. 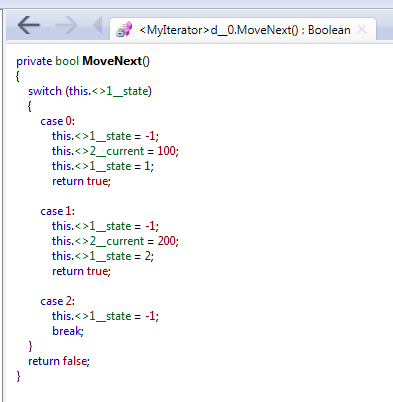 You’ll notice that the class implements GetEnumerator, which just returns the current instance of the class. (Code shown is from Reflector). The MoveNext method returns the next element in the sequence.